Jesus and God: Are They One and the Same Person? Most of our Apostolic/Pentecostal groups (often called “Oneness” or “Jesus Only”) in describing who Jesus is in relation to God are probably best known for using the phrase Jesus and God are “One and the same.” We proclaim Jesus and God are “One and the same” person (Jesus is God and God is Jesus) and although the Bible does not explicitly make these statements verbatim, our justification is based on scriptures we say “implies” this understanding to be correct. There are other verses that confirm the existence of One God however they also indicate that there was a man (named Jesus) who being the chosen Lamb of God died on the cross for the atonement of sin (John 1:29; Romans 5:8 – 11). This man God resurrected from the dead (Acts 2:32, 4:10, 10:40, 13:30, 13:37) ascended up to Heaven and is now in heaven with GOD and holds a completely different status than God (Hebrews 4:14, 7:25, 9:24; Romans 8:34). These passages of scripture (and there are more) clearly reflect Jesus as a man. These are biblical stated facts (something we can prove) anything else is a man-made conjecture (something not found written in the Bible ANYWHERE); They do not reflect Jesus as GOD or GOD the SON. Many who do not study the Scriptures for themselves have relied on man-made doctrines that are false, misleading and often contradictory to biblical statements and sound doctrine, which has led to much confusion specifically when it comes to a correct understanding of the Godhead and just exactly how Jesus fits into that puzzle and who exactly Jesus is. Most biblical interpretations pertaining to Jesus can be tested as being true or false by a simple three step process: Identification, Verification and Test it to prove it. An interpretation may sound or even “appear” to be possible and yet be totally wrong if it is not correctly applied. In fact, such near misses of interpretation can be the most treacherous, since they are so close to the truth. These interpretations may satisfy one condition yet not meet another necessary condition. As individuals mature and become more knowledgeable in the Word of God it becomes apparent that “other” scriptures exist that otherwise challenge the soundness of the historical “Oneness” or “Jesus Only” doctrinal point of view. Factors that we (THOSE OF US who carry the banner of being “Oneness”) have not addressed either in print or publicly; Now would be a good time to do so. The following illustrations demonstrate the difference between fact and false theology, truth, and tradition, and will help you determine how to test and prove for yourself that which is biblical and of “sound doctrine” in contrast to that which is not true. Let’s consider these five groups of words; (square & circle) (Father & Son) (God & man) (God & Son of God) (Spirit & Flesh). Each of these groupings contains different words that have specific meanings. Each word has specific characteristics (or features) that makes it possible to distinguish one word apart from the other. We are therefore able to make an informed decision as to the truthfulness of a statement as it would pertain to one of these words. 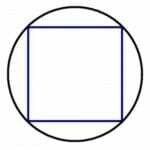 Example 1: Are These Figures (Square & Circle) One and The Same? Why? 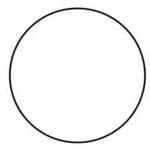 This is a circle, it is round and symmetrical there are no straight edges and it resembles a ball or the full moon in shape. 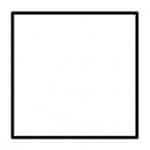 This is a square, it has four equal sides that are perfectly straight and meet at 90-degree angles creating four corners. Example 2: (Father & Son) Are They One and The Same? Why? In the Bible, we have written words. These words have been translated and defined based on accepted and common sources such as the dictionary, the Lexicon or historical use. When we read the word of God it is expected to be read encompassing the whole word in harmony. Clearly, in the word of God, a father is the source of the son and the son is the lineage or heritage of the father. All instances in the Bible of fathers and sons it is never shown that a man was his own father or that a son begat his father. The father was always the creator of the son, the son was born subordinate to the father and received his power, authority, inheritance, etc. from the father. We cannot take the common definitions of words (Father and Son/God and man) out of context and bend them just to fit our own personal theology. NOTE 1: It is true men were both fathers and sons but they were never their own father or their own son. Sure, we can say God can be both his own father and his own son, the exception is God can do anything except lie (Titus 1:2). God gave specific criteria for the sacrifice that would satisfy the redemption of man, the humanity of, not the deity of satisfied that criteria. If you dilute the humanity of a man overcoming the same challenges and temptations that we face we lose the significance of the sacrifice. It becomes God circumventing the natural order he created and the criteria he ordained, we dilute the sacrifice. Jesus becomes a God/Man that never overcame the same temptations we face as human beings because he would have had the advantage of being God and perfect without ever having had the free will choice to submit his flesh to the cross, God did not choose to be sinless, he was never anything but sinless and cannot sin. Whenever the bible reflects more than one “person” (i.e., Jesus & God, man & God) or uses the plural pronouns (we, our, they, us) associated together as being one, (“that they also may be one in us“, or “that they may be one, even as we are one” (John 17:21-22)) it is always reflective of a specific category to which the referenced individuals belong, in this case “they” (plural) are considered as “one” in the same manner as “we” and “us” (plural) are considered as one; that is they are (as a group) unified, on one accord or of one mind (2 Corinthians 13:11; Philippians 2:2). Jesus clearly describes his understanding and concept of Oneness with God in this passage. Jesus unmistakably wanted the church to be one, (United) with each other and with “Us” (Us = God and Jesus). Jesus explains his understanding of that oneness as he describes his personal relationship to the Father. Verse 21 states, “that they all may be one, as You, Father, are in Me, and I in You;” Jesus plainly states, in verse 22 “that they may be one just as We: I in them, and You in Me;” Jesus wants the church to have the same relationship with God that he has with the Father. Based on these verses above, which record the prayer of Jesus, it was not his intention or understanding that every believer throughout history would become God. It is also clear he did not consider himself God; but one with the Father, indwelled with his Spirit, purpose, and committed to his plan. distinguish the difference between having the “Spirit of God” from the “spirit of man”; that which makes man human and separates him (his humanity) from being God. Many churches instill in their members a non-biblical or “created concept” called “incarnation”. This is a fundamental tenant used by many churches to support the teaching that God (“the Father”) was something other than just a Spirit (John 4:22-24); God was also “totally human” by means of incarnation. God embodied himself in a body of flesh (Jesus) and by doing such that made God “totally human” (or a complete human) while at the same time he was “totally God”. There are those who classify themselves as “Trinitarians” (Catholic, Methodist, Lutheran, etc..). They profess that God consists of three persons in one God, all three are “co-equal”, “co-eternal” and “co-substantial” in persons known as God the Father, God the Son and God the Holy Spirit. This concept is called “Trinity” or “Tri-unity”. Each person is given a unique characteristic when viewed in relation to the others: the Father is unbegotten, the Son is begotten or generated, and the Spirit is proceeding. Jesus was the “incarnation” of God the Son, the second in the Godhead. Trinitarians frequently use the diagram of a triangle to explain their doctrine. The three corners represent the three members of the Trinity, while the complete triangle represents God as the whole Trinity. Thus, the Father is not the Son is not the Holy Ghost. Furthermore, neither Father Son nor Spirit is completely God without the others. There are those of us who classify ourselves as “Oneness” (Apostolic, Pentecostal, and various Non-Denominational churches). Most of these groups presented God with a slightly different twist than the Trinitarians. They profess that God consists of three manifestations but not in the manner the Trinitarians portray Jesus. They believe that Jesus was the “incarnation” of God himself. The fundamental difference is that they believe “Father, Son and Holy Ghost” are titles which belong solely to Jesus. They teach God came to earth in the form of a human infant, called himself Jesus, then acted as (or pretended to be) his own Son to himself (while he was in his human body of flesh) and used his “own” human body (that committed no sin) to be the sacrificed atonement for the sins of the world. Although there are many other differences that distinguish these groups apart (Oneness/Trinitarians) they both teach and instill in their members the same non-biblical “created concept” called an incarnation, that God was “totally human” by means of incarnation. God embodied himself in a body of flesh (Jesus) and by doing such that made God “totally human” (or a complete human) while at the same time he was “totally God”. By definition: The Oneness of God in Christ refers to the “singleness” of God who was “in” Christ. (2 Corinthians 5:19) “To wit that God was “in” Christ; < NOT > God was “incarnated as the Christ”. Unfortunately, this is how many Christians were led astray and deceived into adopting non-biblical terminologies in an attempt to support their own man-made doctrines instead of adhering the word of God.